When the weather warms up, find a spot to cool off in Branson. All over town, you’ll find just what you’re looking for to satisfy that sweet tooth of yours and bring smiles to the whole family. Take your pick between shaved ice, old-fashioned handmade ice cream, or self-serve FroYo, and more… or try them all! We won’t judge. No matter what you choose, you’ll be glad you did. 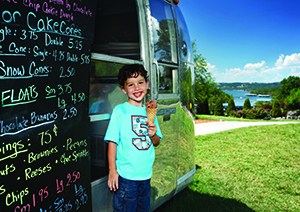 Here are a few of our favorite local summer hot spots for cold treats. Shaved ice has become the hot topic during the summer months in Branson. With Sno-Angels and Yeti’s Shaved Ice, Branson locals and visitors have found the classic dessert they’ve been looking for. 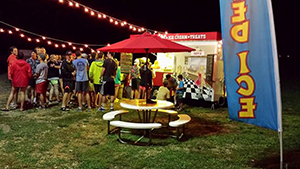 Serving up the classic shaved ice treat, or adding ice cream to the bottom, Sno-Angels and Yeti’s offer a night of fun for your family or friends. Stop in for a visit at one of these two great locations… your taste buds will thank you. 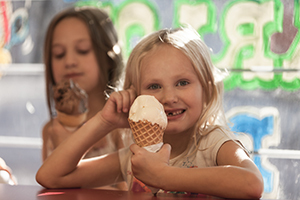 The smooth taste of Frozen Custard has been around our region for years and you can bet it’s a great way to spend a hot summer night if you’re looking for a cold shake, jackhammer, or sundae. Here are a couple places who serve fresh frozen custard for you to enjoy. Who doesn’t love self-serve frozen yogurt (or better known as FroYo)? Everybody loves it. And Branson has two great locations to find your FroYo fix. Located right downtown, or just off the Strip, here are a couple local FroYo joints to satisfy your sweet tooth. Seriously, we do. That’s where there are so many different ice cream shops to visit in Branson. So take your pick—there are plenty to choose from. Go ahead and find your “cool down” at one of these ice cream hot spots.